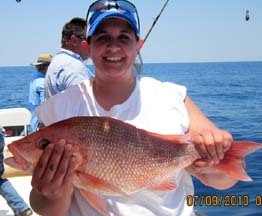 Looking for a Red Snapper Charter from Steinhatchee? Contact Big Bend Charters! If you don’t have a passel of fishing partners, Capt. Brian Smith of Big Bend Charters in Steinhatchee has just the deal for you. Brian occasionally has extra fishing spots aboard his comfortable 32-foot, twin-Suziki-powered catamaran and makes special prices to individual anglers in order to fill that space. An upcoming ‘deal’ is on Friday, May 15. Brian has 2 open slots for a 12-hour red snapper trip. The cost is $185 per person (excluding tip to captain and mate) and promises to be very productive–and lots of fun. For complete details, call Brian or Gina at 877/852-3474.